>Basic details like Business Name along with Goods and Service Taxpayer Identification Number (GSTIN), period for which the return is being filed, etc. >Details of invoices issued in the previous month and the corresponding taxes to be paid. >Details of advances received against a supply to be made in future. >Details of revision in relation to outward sales invoices pertaining to previous tax periods. Submit monthly details of inward supplies in Form GSTR-2 by the 15th of next month. GSTR-2 includes details of the inward supplies or purchases of goods and/or services by the taxpayer. Data in GSTR-2 is auto populated based on the GSTR-1 filed by the taxpayer. You (as the taxpayer) just have to validate this auto populated information on the GSTN portal and make modifications, if required. For example, if you are buying goods from company B, then company B would have filed its GSTR-1 and included your name and GSTINas the buyer. Accordingly, the same information will be reflected in your GSTR-2 as purchases which you need to validate. GSTR-2 will thus include the details of auto-populated purchases. There is no option to revise the GSTR-2. However, rectification (if any) is to be made in the GSTR-2 for consecutive months. Submit monthly return along with payment of tax due in Form GSTR-3 by the 20th of next month. 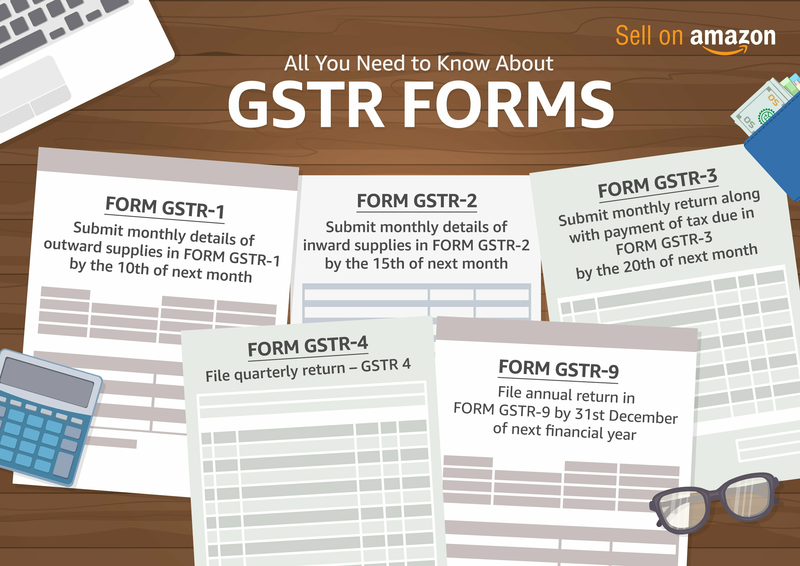 GSTR-3 is a combined version of GSTR-1 and GSTR-2 with details of sales provided under GSTR-1 and details of purchases mentioned in GSTR-2 along with the GST liability for the month. You (as the taxpayer) just have to validate this auto populated information and make modifications, if required. >Information about input tax credit ledger, cash ledger, and liability ledger of the taxpayer. >Details of payment of tax as CGST, SGST, and IGST. >Taxpayer will have the option of claiming a refund of excess payment or to carry forward the credit. To address the concerns raised by the various trade and industrial bodies, and to ensure the smooth roll out of GST, the GST Council decided to extend the timeline for invoice-wise return filing in Form GSTR-1 and Form GSTR-2 for a period of six months, i.e. up to December, 2017. Now businesses need to file a simple return in Form GSTR-3B by declaring the summary of inward supplies and outward supplies. Submit quarterly return in Form GSTR-4 by 18th of the month after the end of a quarter. >The total value of consolidated supply made during the period of return, i.e. during the quarter. >Details of payment of tax. All taxpayers would be required to submit an annual return under the GST regime in Form GSTR-9. This is intended to provide complete visibility about the activities of the taxpayer. However, any taxable person registered under composition scheme and filing quarterly in Form GSTR-4 is required to submit the annual return in Form GSTR-9A. >It will be a detailed return and will capture details of the income and expenditure of the taxpayer and will regroup the same with the monthly returns. >A major advantage of this return will be that it provides the opportunity to correct any short reporting of activities undertaken. >The system will automatically reconcile all the data filed earlier and determine tax liability payable if any against the tax actually paid. >The due date for filing the return is 31st December of every year in respect of the financial year ending on 31st March of that year. The same has to be filed along with the audited copies of the annual accounts of the taxpayer. For any GST related queries, please contact your tax consultant or a GST Suvidha Provider. There is certain software available that enables you to manage your business and help you file the relevant GST return forms. For e.g., you can consider the Tally.ERP software which can help you manage your inventory and can generate your required GST return forms. For a detailed explanation of the Goods and Services Tax, you can read our post here. If you are not a seller on Amazon.in, you can start your journey today. Disclaimer: By using Tally.ERP 9 or any other Tally product, software or service ("Service"), you acknowledge that the Service is provided by Tally Solutions Private Limited, to the complete exclusion of Amazon Seller Services Private Limited ("Amazon"). Amazon makes no representation, warranty or guarantee as to the accuracy, quality, completeness, timeliness or reliability of the Service or its features. Amazon hereby disclaims all liability and assumes no responsibility whatsoever for consequences resulting from your use of or reliance on the Service. You acknowledge and agree that you will use your best and prudent judgment before using/availing the Service and will use/avail the Service in your sole discretion and at your own risk. Whilst Amazon Seller Services Private Limited ("Amazon") has used reasonable endeavors in compiling the information, steps and process provided above, there is no assurance as to the accuracy, completeness or usefulness of the information or that such information is error-free. The steps or process described above and in the presentation are indicative and may change at any time. Amazon hereby disclaims any and all liability and assumes no responsibility whatsoever for consequences resulting from use of such information. Information provided may be changed or updated by Amazon at any time, without prior notice, and at Amazon's sole discretion. Any copying, redistribution or republication of the information, or the content thereof by the seller, without prior written consent of Amazon is strictly prohibited. By proceeding to use the information, steps or the process described above, you do so at its own risk and expressly waives any and all claims, rights of action and/or remedies (under law or otherwise) that the seller may have against Amazon arising out of or in connection with the use of or reliance upon such information. Have a question about selling? How can you become an Amazon Prime Seller?